After a little, oh, two week break from any writing, time to get this thing updated. -On Tuesday a pair of 2012 draft picks, both names familiar in Albany, agreed in principle to entry level deals. The first announcement was for forward Ben Johnson, a 3rd round selection who appeared in 5 games as an amateur tryout at the end of the regular season after finishing his third year with Windsor in the OHL. The second is fourth round choice Ben Thomson, who participated in Albany’s training camp in September before returning to Kitchener in the OHL. Thomson split the season between Kitchener and North Bay, scoring 45 points in 55 games and adding 14 points in 22 playoff games for North Bay. There is a chance Johnson could return to Windsor next season for his overage year. In Lou We Trust posted a scouting report earlier today on both Bens and also Graham Black. -We have our first A-Devil moving on, as earlier this week forward Harri Pesonen signed a two year deal in Switzerland, for Lausanne in the NLA. With the Griffins out, there will once again be a new Calder Cup champion. All four remaining teams are looking for their first Cup, with Wilkes-Barre/Scranton being the closest, finishing as runners up in 2001 (Saint John), 2004 (Milwaukee), and 2008 (Chicago). Toronto finished as the runner up to Norfolk in 2012. Texas and St. John’s are looking for their first ever Finals appearance. -Meanwhile over in Belarus, there is one A-Devil participating in this year’s World Championships. Raman Hrabarenka (well, Roman Graborenko according to the official roster) has appeared in 7 games for the host country, posting 2 assists. It’s that time again, the annual Year in Review. As I have done the past three seasons, I will break down the year in 3 parts: the stats, some fun with numbers, and a few memories of the season gone by. I’m still kicking myself for not going to Dunkin a month ago before the second job…then again if Dan Kelly saw me in line he’d probably make me pay up. Just because that’s the way he is with me. Still laughing over #JoeWhitneyFacts in honor of Joe’s NHL debut back in January. Too bad most of them have disappeared since then. Most awkward road trip? The schoolday fail in Bridgeport. Apparently half of Connecticut can’t drive in wet snow shower conditions. And a bunch of us from upstate NY could. 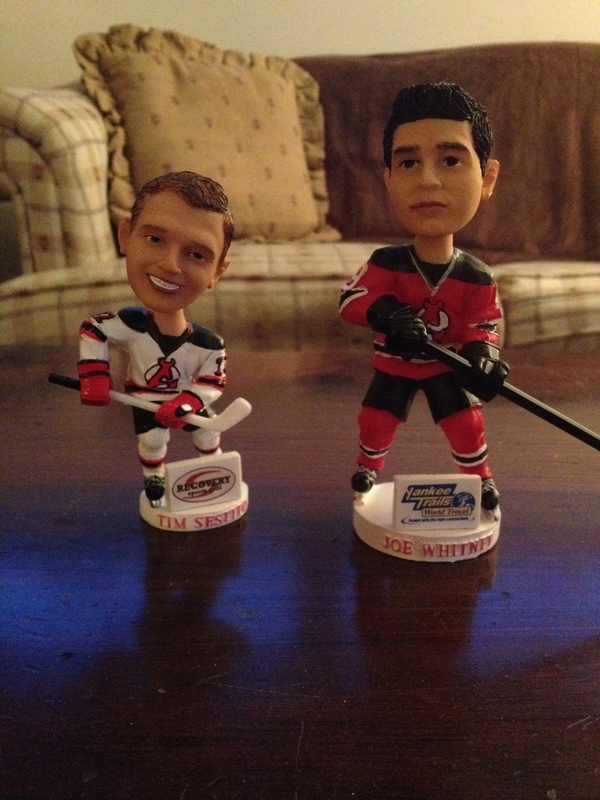 …when the Joe Whitney bobblehead towers over the Tim Sestito one. -when you check in at the hotel in Wilkes-Barre you discover you’re on the same floor as the team. During pregame naptime. 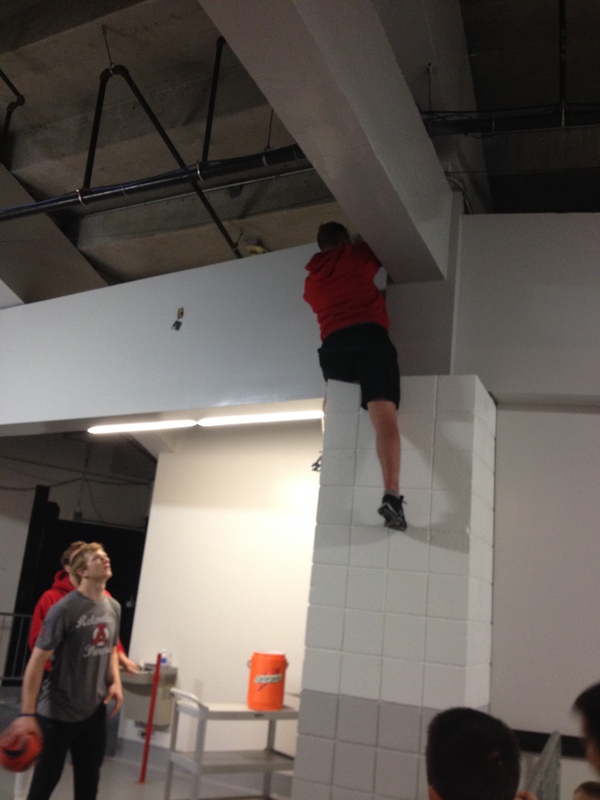 -when Brandon Burlon turns into Spiderman to retrieve a soccer ball in the ceiling. 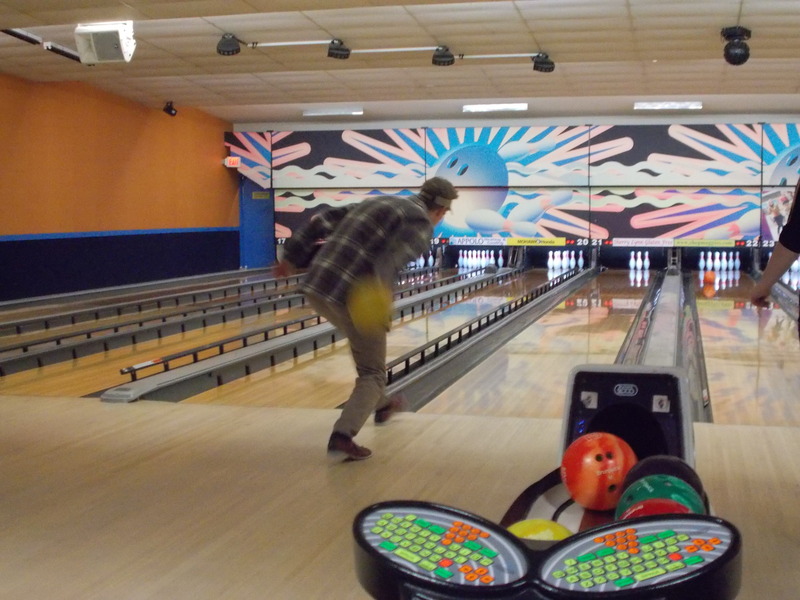 -when watching soccer you volunteer to grab a loose ball…and end up kicking it further down Exhibition Hall. -when half the team accidentally boards the wrong bus in Glens Falls. Don’t think you want to go to Philly with the Phantoms, guys. -when Alexander Urbom nearly walks in front of your car as you’re leaving the parking garage. Pay attention, will you? Most adventurous road trip? A tie…getting stuck in a snow squall in November coming home from Glens Falls and my 600 mile odyssey through 3 different cities in early April (Syracuse to Wilkes-Barre, Wilkes-Barre to Glens Falls). I don’t know how these guys can play with that kind of travel…just driving it fried me. And the fact Interstate 81 between Syracuse and Binghamton is essentially a black hole of nothing. Favorite postgame activity: being a temporary babysitter for Tim Sestito’s two kids. I couldn’t leave the building without at least a big hug from Sloane or having to chase Jude around to catch him. When it gets to the point where Harry himself (who would jokingly roll his eyes at us if we dared forget the signs) came up with his own to get him in the lineup (Young Caged), you know it’s bad. Other overused ones: #FreeHoeffel, #FreeScarlett, and very popular towards the end of the season, #whyisurbomstillhere. And the usual #Blame (insert ref here…a few got that treatment this year too). -To my fellow AHL bloggers/tweeters for the support and kind words, especially during tough losing streaks and down the stretch getting into the postseason. -To my friends in New Jersey for the laughs and countless jokes about a whole variety of things…and certain photos of Swedish defensemen…and the support in the postseason as well. -To the crew at home for helping me with tweets, keeping me laughing even on days when games were going badly, and keeping the players (and goalie coaches) in line. -To the players, thank you for being awesome and for the most fun I’ve had in four years of having the Devils back in Albany. Hopefully you can build on this going into next season. 35: Players who made at least one appearance this season. 10: Players who made at least one appearance in New Jersey. 53: Shots in a 4-3 loss to Adirondack on April 6th. 1: Shots in the third period in a 4-3 shootout loss to Hartford on February 1st. 14: Combined goals by the Devils and Bridgeport on November 30th (Devils won 8-6). 45: Games in which Albany scored first. 4: Wins against the Western Conference (all against Utica). 93: New franchise record for points in a season. 9: Players with 10+ goals. 4: Goalies used during the regular season. 2: Penalty shot attempts for Harri Pesonen on October 25th against Hartford. 0: Wins in 4 Atlantic City “home” games. 9: Shutouts by Devils goaltending. 0: Wins against Worcester and Hershey. 7: Most goals allowed (2/16 vs. Bridgeport). 6: Longest winning streak, from December 4-21. 10: Rookies that made at least one appearance. 1: Goal scored on Michael Hutchinson in two games in St. John’s during the first round. 4: Power play goals scored in the first two games against St. John’s. 16: Years since a New Jersey AHL team won a playoff series (River Rats defeated Hamilton in the ’98 CC Playoffs). The series shifted to Newfoundland on Wednesday night, where a sold out whiteout was in effect. The Icecaps dominated in shots during the first period, outshooting the Devils 17-6. But Keith Kinkaid was up to the challenge, making quite a few big stops early on. But off a Darcy Zajac turnover, Kael Mouillerat would breakaway and score with 2:10 left in the period for a 1-0 lead. And that goal would stand up for goaltender Michael Hutchinson, as he only had to stop 8 Devil shots in the second period. Third period Albany would outshoot St. John’s 10-5, but with still nothing getting past Hutchinson, it was too little too late. Hutchinson would stop all 24 Albany shots, and the Devils found themselves in a 2-1 series hole. Kinkaid was outstanding in net, stopping 34 of 35 shots. The penalty kill was a little busy thanks to 3 minors in a span of 8 minutes from Jon Merrill, among others, but managed to go 6 for 6. Throw in all the must win cliches you want and they all would describe the Devils situation going into Friday night’s Game 4. Unlike the night before, Albany outshot the hosts 12-6 in the first period. But it was former River Rat killer Andrew Gordon (who was a key cog in sweeping the River Rats in their last ever playoff series while with Hershey) who got the IceCaps on the board 3:47 into the first. He would then add a shorthanded goal 8 minutes into the second for a 2-0 lead. Jon Merrill would answer less than 2 minutes later with a goal of his own, cutting the lead to 2-1. But that was all the offense the Devils could muster. Gordon would singlehandedly put the nail in the proverbial coffin by completing the hat trick on a power play late in the second for a 3-1 advantage. John Albert would add a goal to make it a 3 goal lead. And Michael Hutchinson took care of the rest, stopping 39 of 40 Devil shots on the night, and in turn ending the Devils season with a 3-1 series win. Keith Kinkaid stopped 29 of 33 shots, but had no help offensively over the last two games. Eric Gelinas was the only Devil to finish above even in plus/minus, but he was forced to leave in the second due to injury. Upset specials all over the Eastern Conference, as all 3 division champions are out. The top 4 seeds in the West all advance. Unfortunately for the Solar Bears, they saw their season come to an end Tuesday night on home ice against Cincinnati, falling in Game 6 2-1 and losing their first round series 4 games to 2. Maxime Clermont did not play in the final game due to injury. He finishes his season with a combined 11-12-2 record and a 3.35 GAA , and 1-2 with a 2.03 GAA and one shutout in 3 appearances in the postseason. The season may be over, but I have some unfinished business: the other two parts of my season review. Look for those later this week. I will also be bringing back the Free Agent Tracker in July and recapping this year’s NHL Draft class. And keeping up to date with signings, schedule hints, and any other newsworthy items as the summer goes on.